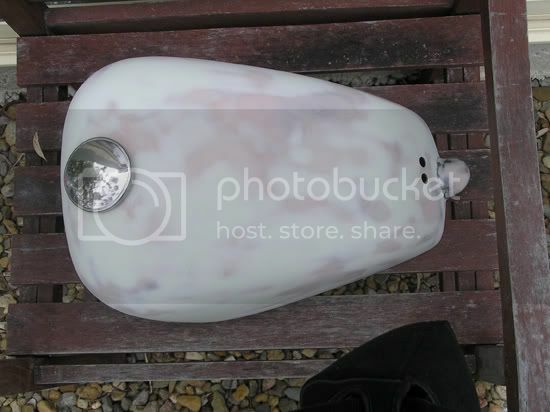 Here is a pic of the body filler etc that was used. I used Septone Car Filler, but any good 2 pack filler can be used. First, prepare the metal by sanding all over with a 24 Grit Sandpaper Disc on either an Orbital Sander or Electric Drill with a Sanding Disc attachment. This gives a good surface for the filler to adhere to. In the pic above you will see a Surform. After the Filler has set, use one of these to shape the Filler. It is good for removing bulk where you don't need it. On a tank you can get the curves shaped nicely with one of these. I use a curved one, or you can use a flat one. 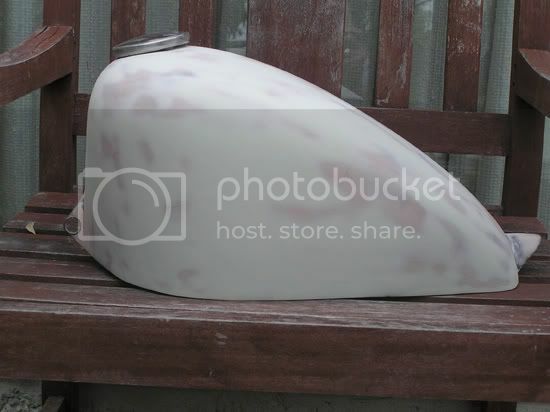 The curved one is better for rounded surfaces. Build the filler up where you need some depth by about 3mm at a time, allowing for each coat to dry. After roughing it out with the Surform, then use 80 Grit Sandpaper to sand it down, then 120 Grit to get it smooth. Lay a piece of clean, soft cloth over the surface and move this back & forth, up & down & around with your fingers. You will be able to feel any imperfections and apply a bit more filler to these, then sand again. Wear a mask!! Its a tedious, dusty job! I applied Septone to the entire tank surface. Big job , but as you will see, worth the effort. 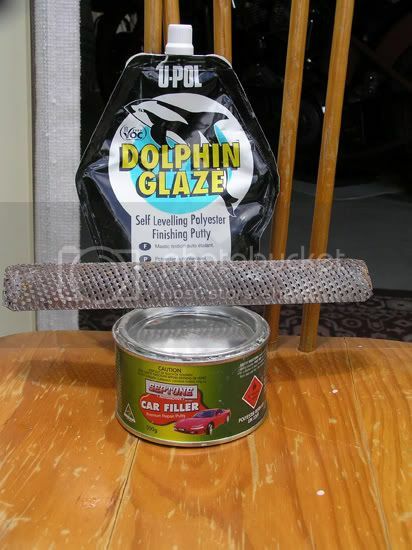 To get a nice smooth finish, and to fill any pin-holes which may appear, then apply a coat of the Dolphin Glaze Finishing Putty, which you buy from an Automotive Paint Supplier. It is a lot softer than the Septone, and is sanded with 180 Grtit Paper, and finished with 400 Grit. This is what the tank looked like after all this had been done. You can see how I have rounded the top curve up, to reduce the filler spout rise, and curved the front to cover the extra metal & incorporate the mounts. Excellent "how to" Tex, and the end results are fantastic.